STILL STEDS 8.18r8 - 2019, Lift trucks, fork lifts, original spare parts, workshop manual, diagnosis, user manual and etc., STILL STEDS 8.18 PARTS REPAIR 2019 Lift trucks, fork lifts, original spare parts, workshop manual, diagnosis, user manual and etc. STILL STEDS 8.19, Stell 8.20, Stiil 8.21, Steell 8.22 Electronic Spare Parts Catalogs, Service and Workshop Manuals, Service Information, Wiring Circuits and Hydraulic Shematic Diagrams, Diagnostic equipment. Spare parts catalog STILL Steds 2019 - including spare parts catalogs for STILL Wagner, STILL and SAXBY. The management of STILL STEDS 8.14/2014 spare parts presented on a site provides detailed information on spare parts and accessories, repair manuals, maintenance instructions, detailed catalogs of spare parts, the service manuals intended for improvement of level of servicing of the equipment of the STILL STEDS company. The electronic management of STILL STEDS 8.18 also contains full catalogs of original spare parts and accessories for STILL Wagner, STILL, SAXBY and OM Pimespo. 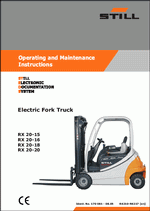 Parts book and operators manuals STILL STEDS 8.18 contain information on technical characteristics of spare parts for STILL STEDS equipment, contain step-by-step operation and maintenance instructions, also contains technical specifications. The electronic STILL STEDS 8.18 program has very convenient and pleasant interface, it is intended for work on the personal computer. Having established STILL STEDS 8.18 software the user can carry out search of the spare part in model, in serial number, in the program there is a huge number of exhaustive information after the electrician. Today the STILL STEDS 8.18 program is necessary for each owner of STILL STEDS latest equipment which is equipped with electronic equipment and which independently wishes to increase quality and level of service, repair and operation of own equipment.